Extras start with two Deleted Scenes. These include “Dog Fight in Vegas” (2:28) and “River Sequence” (2:26). “Fight” offers an interesting alternate method for Bolt to learn that he doesn’t have superpowers, though it seems a bit too dark. “River” performs the same function; it’s more exciting, but I think the final film handles the issue better. The disc opens with ads for Lady and the Tramp, Brave, and Secret of the Wings. Sneak Peeks adds promos for Lion King 1.5, Beauty and the Beast: The Enchanted Christmas, Treasure Buddies, Cinderella, Planes and Prep and Landing: Naughty Vs. Nice. Another disc offers a DVD copy of Bolt. 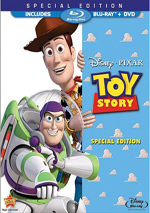 It duplicates the original DVD release. 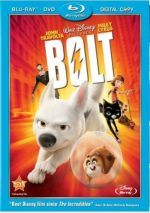 Although Bolt doesn’t compete with the best of Disney’s animated movies, it also never threatens to fall among their worst products. Sure, the film can be predictable and lacks great cleverness, but it keeps us entertained from start to finish. The Blu-ray boasts excellent picture and audio, but its extras seem mediocre. While the supplements disappoint, the disc does enough right to earn my recommendation.